1) Whisk egg yolk and sugar with an eggbeater (balloon whisk). 2) Sieve in flour, mix well. 3) Gradually add in milk and mix well before each addition. Add vanilla. 4) Cook the mixture over medium low heat and whisk constantly with an eggbeater till it thickens, remove from heat and mix well (this is very important to prevent burn bottom), continue to cook till it firms up and reaches soft boil. 5) Remove from heat, add butter and mix well. Custard is done. 6) Whisk custard over ice cubes to lower the temperature. Cover surface tightly with cling wrap if not using immediately. Whisk custard again till smooth before using. 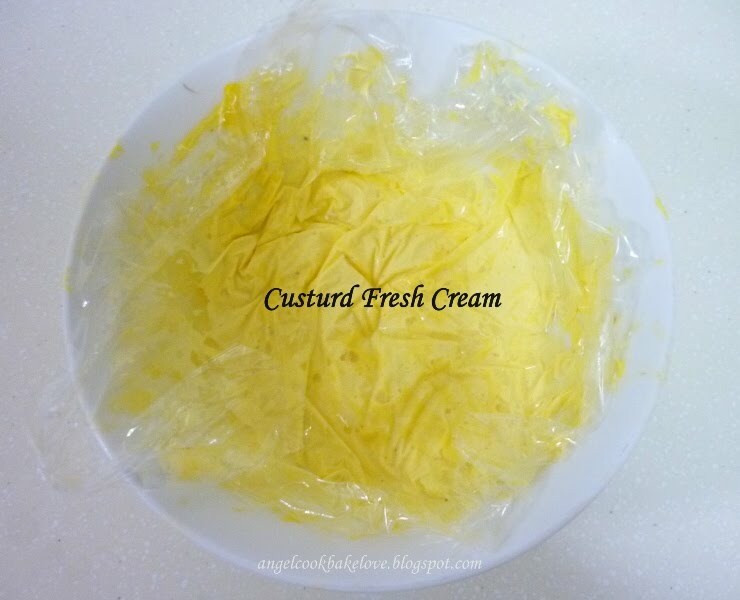 7) Whisk whipping cream, then add into the cool custard and mix well to form custard fresh cream.